When you have small children, chances are you always have bananas in the house and you're probably stuck with a few overripe or half-eaten ones from time to time. This easy and delicious Banana Muffin Recipe has to be the perfect way to use up all your blackened bananas. 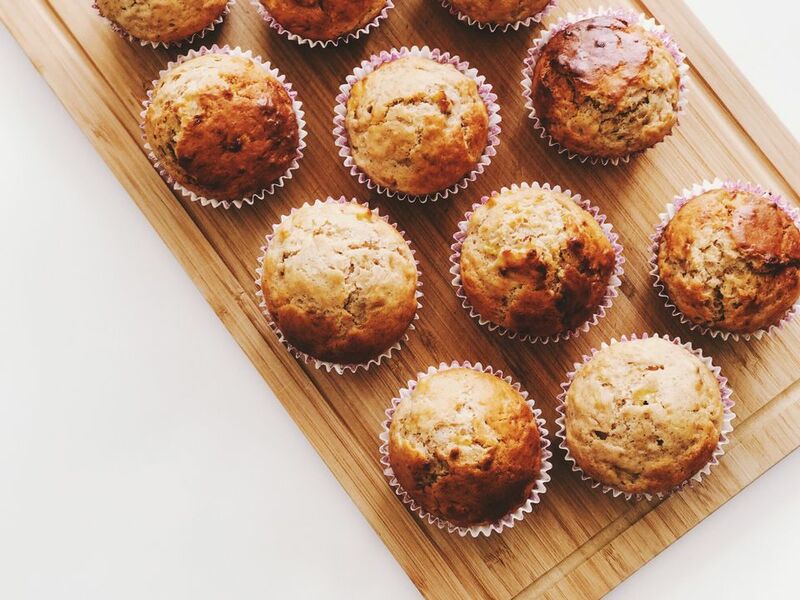 We've sweetened them with honey and used half regular and half spelt flours to make these muffins a little more healthy than other banana breads and muffins. We added a little peanut butter and hagelslag (Dutch chocolate sprinkles) - flavors that kids love - which make them an ideal addition to school lunch boxes. You'll want to make some extra, because they taste even better the next day and are great for breakfast before the school run, too. You will need a 12-cup muffin tin and paper muffin cups. First preheat the oven to 375 degrees F (190 degrees C). Line the muffin tin with paper cups. Measure out the honey, butter, milk and vanilla extract into a microwave safe bowl, and microwave on high for a minute, or until the butter is just melted. Meanwhile, measure out the two flours, the baking powder, baking soda and salt in another bowl. In a shallow bowl, mash the bananas with a fork. Now add the peanut butter, chocolate sprinkles and cooled butter mixture to the bananas and mix well. Add the wet ingredients to the dry ingredients and stir until just combined - do not over-mix the dough or you'll end up with heavy-textured muffins! Now fill the muffin cups with the dough and place in the preheated oven. Bake the muffins for 20 minutes or until a skewer inserted into the middle comes out completely clean. Remove the muffins from the oven. Leave them in the muffin tin for a few minutes before placing them on a wire rack to cool for another 10 minutes. Our Banana, Peanut Butter, and Chocolate Muffins can be eaten warm, slathered with best-quality butter or completely cold. Stored in an air-tight container, they will keep well for a few days. Learn more about Dutch chocolate sprinkles. How to make your own peanut butter from scratch.